More than a few years ago, I chanced upon an opportunity to take up a job away from the hullabaloo of city life – teaching in a school set closer to heaven than a petrol station. Being on the mountains of the Western Ghats, electronic anything had a limited influence over my tranquil existence. What of it? Well, I read nearly all the books in the library, sat on the grass for hours quietly, had my meals without a telly in the background and…wrote letters like my Daadi did. That short stint at a monastic life ended as I, literally, and figuratively, descended to my urban lifestyle, crowded with every possible mode of digital distraction. You can hardly be alone, in this modern age. Bombarded with gadgets that fit your palm to the huge screens that have replaced walls, you cannot escape the captivating attraction of being connected, entertained, stimulated and engaged all at the same time! And what happens when your senses are overactive – when you are checking your inbox, a whatsapp message, an SMS, the latest beer commercial, the number of “likes” on your clever status message? You end up being, what is colloquially called, a Multitasker – one who does many things at once. Take this Neilson report on distraction statistics during Prime Time TV telecast, published in 2012, for instance. Among the results, here are some that stood out. Teenagers spend up to 8 minutes on game consoles, while watching TV. 61% of the population check their emails, followed by 47% their social networking sites, again while meandering through the intricate plot of House of Cards. Teenagers and adults, well into their 50s, both spend time eyeing their mail inboxes, irrespective of their wrinkles and grays. 45% claim simultaneous TV and Tablet use at least once a day, 69% do so several times a week and only a measly 12% stay away from concurrent temptations. 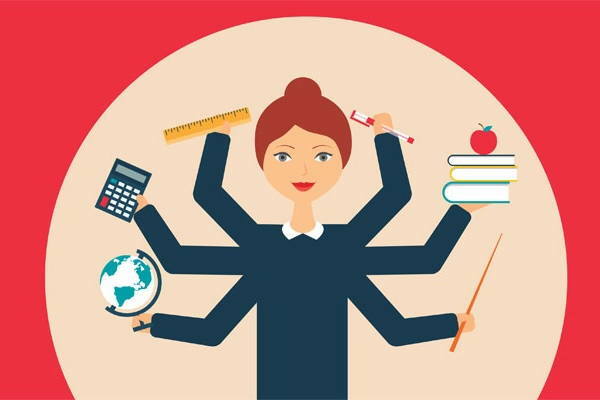 Now, though people may beg to differ and claim supernatural abilities to actually do multiple things at the same time, most multitasking activities involve switching between tasks rather than doing many things simultaneously. So when I am checking my phone, for messages, while watching Game of Thrones,I am switching my brain to focus on the app and not on the next character getting his noggin chopped off! That is essentially how a human brain works. A brain cannot process parallel external information exactly at the same time. The best it can do is shift its focus really fast. For many, multitasking is not a matter of choice. Take, for instance, a young mother feeding her baby and trying to finish a report on the cost benefit analysis discussed at the last meeting, at work. Or an employee taking on an overload of responsibilities thanks to the recent work force reduction, with his boss expecting him to finish three projects by the end of the week. Multitasking, especially at the work place, is now an expectation that you cannot simply ignore. But what could be the implications of making your brain go up the stairs, down the stairs, up the stairs and then run around some, carrying five baskets of independent information, waiting to be processed in a short span of time? Does this switching around cause your brain to function less efficiently than if it had to do only one thing at a time? More appropriate question being, is multitasking frying your brain? Let’s explore what people have to say. A Stanford University study has shown that heavy media multitasking individuals lack cognitive control and are unable to as efficiently process information as their low multitasking brethren do. Their study revealed that the people whose brains have gotten used to jumping around, easily distracted by the shiny pop-up messages or the fifty other things in their surroundings, also have the tendency to cloud important information with the irrelevant. In fact, according to them, these individuals are not even very good at switching their focus or recalling their memory very well. “They are suckers for irrelevancy”, quotes one of the researchers, Clifford Nass. So, if you think that multitasking lets you do a lot many things then you have to keep in mind the amount of time being lost in recovering your brain from the exhaustive jumping around. A University of Sussex research, from 2014, has found a link between lower gray matter, you know the one thing in your brain that lets you make wise choices like not watching any Steven Seagal movies, and heavy media multitasking. So the danger lies in not just the very time that you are indulging in all your media gadgets, losing out on cognitive control, but research seems to suggest that the danger persists, even after you have powered your phone off…but let’s be honest, that almost never happens anyway! Heavy multitaskers seem to have a reduced ACC (Anterior Cingulate Cortex) volume, center that is responsible for executive, cognitive and emotional functions, depending on which part of ACC you are looking at. A strong hyperbole maybe that prolonged multi media usage can make you appreciate Seagal’s movies. And if that’s what you want, may the phone be with you. A direct consequence of the above could be the impact on the emotion center of the brain. Multitasking has allowed management to be under the impression that lesser workforce can handle overloads as long as they are trained at the skill. What management, however, needs to understand is that instead of being able to handle extra work in a short period of time, workers are developing ill effects of anxiety, depression, adult ADHD and other such modern age diseases that come out of stressed out, and overworked, employees. According to a Harris Interactive survey, 9% of the 73% stressed workers owe their blues to too much work and not enough time. There is a reason why texting, while driving, is a big no no. One smiley here can cause you a fatal mistake there. The reason is obviously intuitive. You cannot divide your focus and expect to do two things equally efficiently. Multitaskers are prone to making mistakes. And when you keep making these mistakes, owing to the constant want of focus due to that other thing you have to do, you will lose out on productivity. A whole lot of being busy for nothing. An American Psychological Association study showed that when humans switch between tasks, they go through two distinct processes – a goal shift and a rule activation. All’s well when you have to switch mechanically, without awareness, and redirect between the goals and the rules of two similar tasks. The problem occurs when the switching faces conflicts between the two demands and when decision making is involved. That time lost in recovering, while switching, can add up as you have to go back, remember where you left off, and start from a few steps back, each time. An estimated 40% can be lost in ones’ productive time. Not to mention the huge room for error between the juggling acts. There are many who support multitasking as well. A Hong Kong University study has even indicated that people who use different media at the same time are able to train their brains to integrate the various information. But leaving ideological politics aside, you cannot deny the fact that, given a chance, it just feels right to slow down and take one thing at a time. I mean, there was a life, not too long ago, when TV programming was interrupted with a daily routine of multicolored lines and a deafening beep sound. We did manage to keep in touch with the clunky landlines and no text messages. Inland and postcards were still a way to tell our loved ones that all’s well in this part of the world. There was no compulsion to instantaneous responses for “Action Required” emails. No one felt dejected for not having at least 50 likes on their profile picture and people would actually meet and greet without their eyes locked on their smartphone screens. Maybe there are people who have mastered the skill of multitasking, making their 24 hour days seem like 24 hours and then some. Maybe they are perfecting their ability to sleep with one eye closed, lest they miss out on the two hour booster on Candy Crush.